Hearts Wide Open is a treasured Hartford-based group of kirtan-loving souls bound together by their love of the music and its impact in opening their hearts to each other and to the Divine. 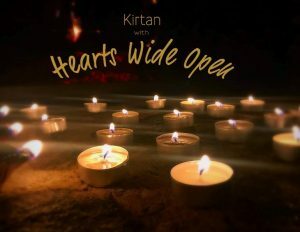 They enjoy passing the lead around the group, so that you may experience kirtan in a number of different styles and voices. The group also adds untraditional instruments to their music, including cello, violin, and banjo. We are excited to bring Hearts Wide Open here to UUS:E for all to enjoy! Open your own hearts, just as Springtime in May opens wide her beauty to us all, and sing, sway, or just drink in every minute of this life-affirming evening! ALL ARE WELCOME. While a $15 donation is requested at the door, no one is ever turned away. Chair seating is provided. Bring your own floor cushions if you want to sit on the floor in the front. Footwear is optional. Remind your friends that UUS:E is a scent-free space. Unitarian Universalist Society: East is a welcoming, open-minded, spiritual community seeking truth and meaning in its many forms.